Rinse and pat the Haddock fillets dry with a paper towel. Place in a baking dish, drizzle with olive oil and season, turning to coat. Season as you prefer, we used salt, paprika, tumeric, onion powder and salt-free spike (I like salt-free seasoning blends best, so we can better control the amount of salt added). Cover and bake at 350ºF until fish is opaque white in color and flakes with a fork, approximately 20-30 minutes. The millet only takes 20 minutes. Ratio of water to millet is 2:1. 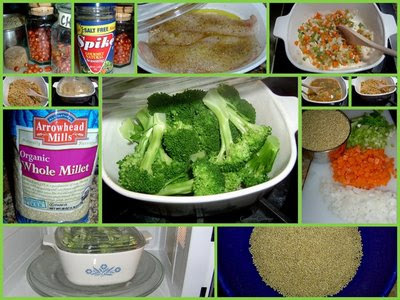 One cup of millet will yield 898g of pilaf and serve 4-6. Rough chop (small size) some carrots, celery and onion (mirepoix). Use however much of this aromatic trio you desire -- it can be more or less than 1/2 cup -- no need to get hung up on the measure (more carrots = more vitamin A). Saute using a small amount (1-2 tablespoons) of olive oil directly in the pot you will be cooking the millet in. I regularly cook in old-fashioned, 'Cornflower Blue' CorningWare, since it can be used on a stove-top. Alternatively, stainless steel pots with tight fitting lids work great too. Add whatever seasonings suit your fancy. Again, we used salt-free Spike seasoning, black pepper and a pinch of salt; we also added hot pepper* and curry powder. Stir in the millet and then add the water. Bring to a boil over med/high heat, then cover with a tight fitting lid. Reduce heat to a simmer and cook until all the water is absorbed - about 20 minutes. If desired, stir in some fresh cut garden herbs just before serving. *The GardenCuizine pantry is never without a stash of Chiltepin peppers (Capsicum annuum var. aviculare). These tiny peppers are HOT stuff (50,000 - 100,000 Scoville Units) a little goes a long way! They are known as bird peppers and are small (only ¼ inch round in diameter). Just one adds the perfect amount of heat and will not overpower the dish. Your food will still be palatable to those who don’t like things too hot. And adding a little heat makes food tasty, and allows you to decrease the salt used in your cooking. Steaming is easy and preserves the water soluble vitamins. First wash and trim off enough florets to serve 3 people or however many you are cooking for. Place in a covered dish with a little water added - microwave until tender, but still bright green in color, approximately 3-5 minutes. We never add salt. A low fat salad dressing can be added to the broccoli at the table for those who don't like it plain. Pick something fresh from your garden. I simply used a parsley sprig, if we had been making dinner for company, you may have seen a nasturtium bloom or two. Copyright (c) 2009 Wind. All rights reserved.